We offer guided tours for schools and colleges during the art fair. Supermarket offers an educational session especially focused on art colleges, schools and institutions who are interested in expanding their knowledge of the independent art-sector. 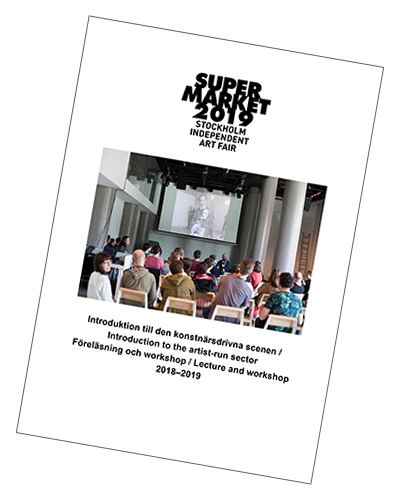 The full session includes a concise introduction to the artist-run sector, a hands-on workshop on self-organised exhibition production and presentation of SUPERMARKET – Stockholm Independent Art Fair. In the dynamic session we present facts and discuss practical questions from contemporary self-organised art scene in a comprehensive and engaging form. Download the bookled with all information below (in Swedish and English).